Hi loves! Remember the beautiful LilypadLacquer shades I showed you last week? Well, it actually wasn't the first time I wore LilypadLacquer Diamond in The Rough - I used it before and complimented it with some stamping! Like I mentioned in my review, this shade is quite easy to apply. You just need 2 coats and while it is a microglitter in a clear base, it's still fully opaque after those 2 coats. Even if there were to be a small blank spot, the amount of sparkle would not let it show ;-). A while back my friend Emily offered to send me a set of Born Pretty Store plates since she had received them twice. Obviously I couldn't say no to that - they have been releasing such fun plates! The plate I used for this look is BP13, you can also buy it in a set and save a dollar ^^. I used Konad black as my stamping polish along with one of the Messy Mansion Pro stampers heads. When I was looking more closely at the design, something occured to me. Please take a close look at it, and take a peek at the macro's I'll post at the end. Then tell me: do you see option A when looking at the image or option B? What do you think of this look? Do you like the sparkle as much as I do? Tell me in the comments! I actually see both options, depending on what part of the picture I focus on. Haha, I remember this manicure very well when you posted it on FB asking this question. i see both but that doesn't matter, the mani and the glitter underneath are both gorgeous! Option A for me! Never thought about B until you pointed it out! W00t! This pattern is one of my favorites ! And I see both options :) Love your mani ! Oh wow, if you hadn't showed option B I would have never seen it myself! But now I do! That's so crazy haha! I love that pattern, I've got it in a different plate and it's always a favourite! Wow I didn't even see be B, but I do now. Love this design and what you did with it. These are stunning!!!! So gorgeous! I've been searching for the perfect background to this pattern and you found it! This looks perfect! Oh, and I can see both options, I just love this sort of patterns! I love gold glitter and black stamping- it's one of my favorite combos! I can't wait to try my BP plates still waiting on them. Haha, I see option A in this manicure! 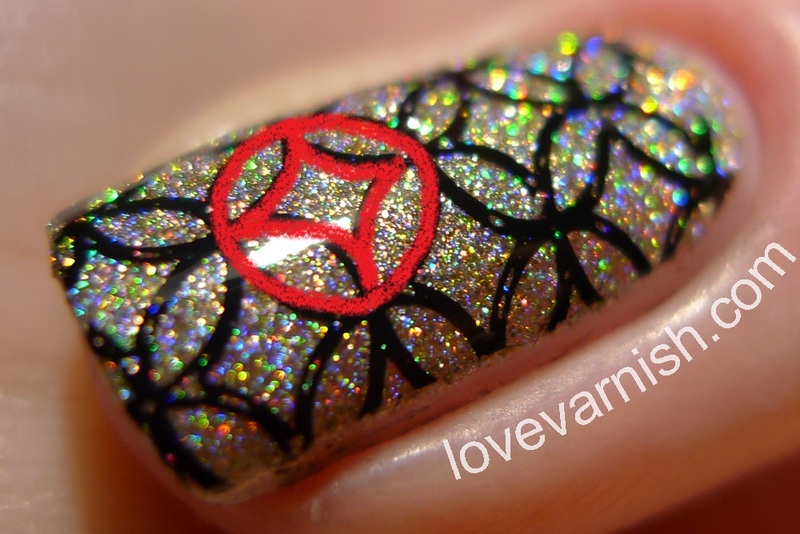 The pattern looks like diamonds to me, so the base color compliments it PERFECTLY! I see option A. :) You're totally slaying it here though with this manicure…hubba hubba!! Glad you're enjoying the BPS plates :D I love this look so much! I always used to see option B but now I'm seeing A haha. I can't unsee it! So gorgeous. I definitely need a haul and pick up more BPS plates, they are seriously on point. Ohhh, these are so pretty!! I love that glitter! Option B! Prachtige nail art! I actually saw overlapping rings. How cool is that! Almost like a mind bender on your nails!! At first I saw Option A but now that you've showed us B, I can see that as well. What a gorgeous look and I love the contrast of the black stamping against that luxurious gold!!! Haha it was certainly VERY blingy :D! I think once you've seen both options lined out you can indeed always see both, funny how that works :). Thanks Lucie, glad you like it so much! Thanks Bella! Funny how the mind works huh? Haha I love how the mind works! I love BPS plates, they are of great quality I think, though maybe slightly less deep etched than others, but that doesn't matter much. Glitter it is! Thanks Mina :). Hope you've received your plates by now and are enjoying them ;-)! That's a perfect match indeed :D! Thanks Jessica, glad you like it so much! I definitely am! Funny how your mind can play tricks with you huh? Yup, they are! And they keep releasing pretty plates all the time. So cool, my mind always goes to option A! I really have to push it to see B :). That's an option as well! Fun! I love mindtricking images :D. Funny how you can now see both! Thanks for the sweet words Dani.